Thank you for considering THE CARPET SOLUTION for your heirloom oriental rug and area rug cleaning. We have been in the rug cleaning business since 1989. Through the years we admire and appreciate the art and beauty of these fine pieces. We have gone through extensive quarterly training on the identifying and cleaning of oriental rugs. Cleaning these rugs takes experience, gentle care, and appreciation of the hard labor, pride and art to make each rug unique. A thorough cleaning is the only way to preserve, protect, and enjoy the beauty of these rugs. Beware of the so called oriental rug cleaner that cleans them in your home. Although you can have success, the only way to clean oriental rugs or any area rug is at a rug cleaning plant. Only a rug cleaning plant will properly dust, vacuum on both sides, spot remove hand wash line dried on a drying tower controlling humidity. If you have any area rug cleaned in your home in our industry it is called “mud cleaning”. Go over to a corner of your rug and shake it. You will see sand,dust,grime that can only be released by proper vacuuming and dusting. Dusting gently vibrates all the sand and grit off your rug with out damaging the fibers. Did you ever see some one put there rug on a clothes line and beat on it with a broom? This is what a dusting machine does except more thorough and gentler. THE CARPET SOLUTION does this to all of our area rugs at our plant 383 Whites Path Yarmouth,Ma.02664. Leaving the sand and grit will cause your rugs to get dirty faster, damaging your rug and making the fibers dull. Before you have your rug cleaned in home, or dropped off at your local dry cleaner “who sends it out and charges a fee on top of the cleaning fee”. Or before you have your rug cleaned in your home please read and ask if these procedures will be completed before cleaning. 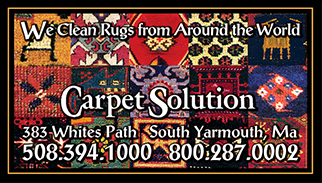 You will find the best way to clean your rugs is at our rug cleaning plant.”383 Whites path Yarmouth,ma.02664” “Exit 8 on the mid cape Route 6 Cape Cod Ma.”.